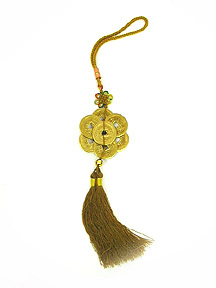 This 8-Fortune Gold Coins Tassel is a special wealth magnet for Period 8, especially potent to improve wealth luck, windfall luck and speculative luck such as trading shares and buying lotteries. The number "8" will be the reigning number of Period 8, and therefore will be the luckiest number in this 20 year cycle. We can tap into its luck by simply displaying 8 auspicious chinese gold coins in a circular manner with a mystic knot holding them to attract extra good fortune to us. This amulet is made from coins that come from the most powerful reign "Chien Lung", thus making it more perfect and possesses unusually high potency. 8 chinese coins would also attract wealth luck from all the 8 cardinal and subdirections. You may hang this powerful wealth energizer on your bags, in your car, in your office or carry them along with you wherever you go to ensure you are never lack of money throughout 20 years in Period 8. This 8-coins amulet is the most supreme version available in the market. It is our own design and manufacture. What the 8 Gold Coins Tassel symbolizes and how to place the object? 8 chinese coins with gold thread, tassel and mystic knot is essential to empower it for endless good fortune and prosperity. The coins must be made of fine metal such as brass or bronze, which are strong and elegant. Some versions are made of resin and brittle in nature, try not to get those version because they lack in metal energy. 1. To increase your business fortune which will result in increased money in your pocket, hang this coin tassel in the northwest to improve overall wealth luck support from the heaven. Also carry one either along with you when you go out for business or hang in the car. 2. To increase windfall and speculative luck and wealth achievement in life, hang this tassel in your sheng chi direction, SE universal wealth corner and water star-8 location in your home or workplace.